Coloring Night at the Library is back! 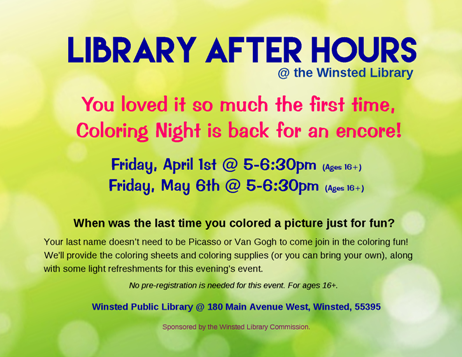 Come join us as we color our cares away on Friday, April 1, 2016, and Friday, May 6, 2016 from 5-6:30pm. You can bring your own projects and supplies, or choose from some of our fun coloring sheets and crayons, pencils, or markers.